Good posture ensures that you use your muscles correctly, thus helping you to avoid sprains and strains and to keep your joints moving smoothly—and to avoid fatigue. 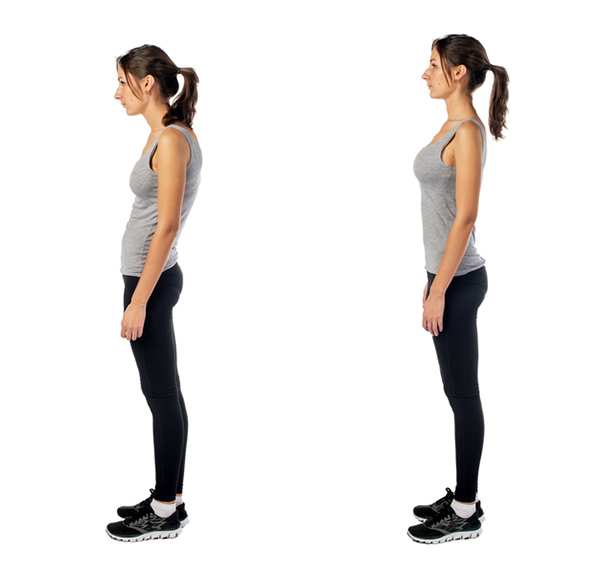 Pay attention to your posture to give yourself a better chance of avoiding kyphosis, the condition referred to as "hunchback." As you get older, several factors can cause a rounding of your upper back and a hunched posture. Known as “dowager’s hump,” the condition is officially called kyphosis, and it’s thought to affect as many as 40 percent of older adults. It isn’t clear what causes kyphosis, but arthritis of the spine, and/or the bone-thinning disease osteoporosis—which increases the risk of vertebral fractures that can contribute to kyphosis—make you more susceptible to the condition. Kyphosis also may result from age-related degeneration of the soft, circular disks between the spinal vertebrae, and/or may be a byproduct of poor posture combining with weak muscles in the upper back. Kyphosis can look unsightly, and it also can impact your health. Studies have shown that older women with a greater curved angle of the upper spine take longer to perform tests of basic everyday function. Kyphosis shifts your center of gravity forward, making it more difficult to balance and increasing your fall risk. When severe, it can cause pain and fatigue and can impede breathing and digestion. Despite its potential impact on your health, there are no recognized guidelines for preventing, treating, or managing kyphosis. However there are steps you can take to help prevent the hunched look from developing, or at least to reduce its severity. Adopting good posture is key. The postural element starts with your head. It’s no lightweight, coming in at about 8 pounds, and proper alignment is vital for supporting its weight. If your head juts forward, its weight pulls on the muscles in your upper back and neck, which get weak and overstretched. At the same time, the muscles in the chest get short and tight, making it difficult for you to bring your shoulders back and down. Your spine ends up curving forward, creating a structural change. This is what you should try to avoid at all costs, as once the shape of your spine changes, you can’t reverse it. You want to correct the condition when it’s still a postural problem, otherwise your spine will “set” this way. If you keep your head lined up over your shoulders, and your shoulders are lined up with your hips, you’re in balance. This means that your body won’t have to work as hard to maintain your alignment. All you need to do then is tuck your tummy in and let your arms hang naturally at the sides of your body. Correcting any bad habits you may have fallen into when it comes to posture is key. It isn’t enough, however, to simply stretch for 10 minutes every few days if you’re continually holding yourself with your head forward and your shoulders hunched. Be aware of any tendency to hunch forward when you’re sitting, and if you catch yourself in the act, stop whatever you’re doing and sit up straight before resuming whatever activity you were engaged in. Also, learn to lift and move things correctly—for example, bend at the knees, not the waist, when lifting, and carry items close to your body. There is evidence that yoga may help to reduce kyphosis and help you achieve better posture. In one study, older women with kyphosis who attended hour-long yoga sessions for three days each week experienced a 4.4 percent improvement in the angle of their spinal curvature. You also may benefit from a course in the Alexander Technique. This system of gentle physical education helps you identify and correct harmful postural habits, such as slouching, that cause muscle tightness and affect your posture. While the technique can be learned from a book or DVD, working with a certified Alexander Technique teacher deepens the experience. An Alexander Technique teacher will very gently guide you into the correct posture with his or her hands—this shows you how exactly you fall into poor posture so that you can work to make a difference yourself. The American Society for the Alexander Technique has a register of local teachers; costs vary depending on where you live. Another thing you should do is address any risk factors you may have for osteoporosis—these include smoking, drinking more than three alcoholic beverages a day, taking daily steroids, and/or having a mother who suffered a hip fracture. If you think you may have osteoporosis, speak to your doctor about whether your bone density should be checked. Current guidelines recommend that women age 65 and older should have their bone density assessed, as should younger women with osteoporosis risk factors. Also think about your muscle strength. Good posture depends on having strong core muscles (these include your abdominal and lower back muscles), since it’s these muscles that help stabilize your spine and hold it straight. Weak core muscles can lead you to slouch. A physical therapist or qualified personal trainer (ask at your local gym or YMCA) can show you a range of exercises that will boost core muscle strength without aggravating any back issues you may suffer from. arthritis, arthritis of the spine, bone, bone density, bone thinning, digestion, for osteoporosis, health, hip fracture, muscle, osteoporosis, osteoporosis risk, osteoporosis risk factors, pain, posture, smoking, strength.